Less flashy than its famous Nevada namesake, Las Vegas, New Mexico, is a town with a stunning location, fascinating past, and uncertain future. Named for las vegas grandes – the big meadows – by its Hispanic founders, this Mexican land-grant settlement along the Santa Fe Trail is located where spacious grasslands fan out from the slopes of the Rocky Mountains to meet the Great Plains. With unlimited space to graze vast herds of sheep and cattle and proximity to beaver-rich streams and mountain minerals, Las Vegas’s status as a magnet for commerce grew exponentially after the coming of the Atchison, Topeka and Santa Fe Railroad in 1879. Until other lines were built and rail commerce was diverted to Albuquerque and elsewhere, this prosperous small city was the country’s most prominent mercantile hub for traders in wool, hides, furs, and Eastern manufactured goods. Although its prosperity dwindled throughout the twentieth century, Las Vegas did not die. 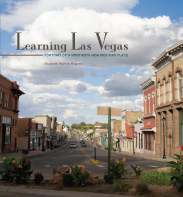 For Rogers the town and its surrounding region offer a case study in the persistence of place, and in Learning Las Vegas she summons the voices of present-day citizens to create a multifaceted narrative imbued with deep-seated attitudes toward politics, religion, and family. History, town planning, and architecture form the canvas on which this portrait is painted. A likeness of each of the more than sixty narrators along with numerous historic illustrations complement Rogers’s remarkable portfolio of photographs. In these we walk with her through the town, view buildings humble and grand, dine in family-run restaurants, and attend fiestas and motorcycle rallies. We visit Gallinas Canyon to relax in the hot springs and pause at Mount Calvary Cemetery where burial plots bear surnames of the town’s original settlers. In sum, both as photography and text, this book is an impressive and lasting contribution to the interpretation of people and place in a unique and memorable part of the world. To purchase, visit your independent bookstore or click here. To view an online slideshow of photographs from this book, please click here.